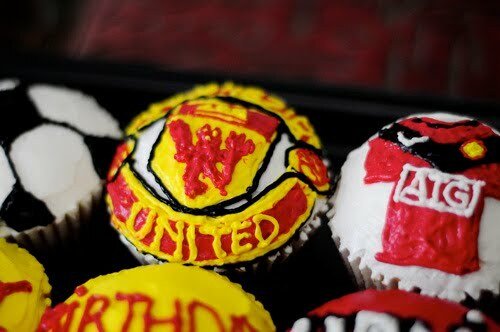 Cupcakes and Manchester United. That's how I get the attention of my brother-in-law. He's a huge soccer fanatic who gets up in the wee hours of the morning to watch soccer live from Europe. 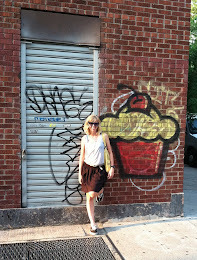 He is also a lover of all things sweet (even though he claims he is on a diet). Spotted these Manchester United cupcakes on sugar crawler blog and knew that I had to post just for him. Enjoy! And for the sake of my sister, let's hope Manchester United does well for the rest of the season. Oooh thank you for posting about my cupcakes, and I'm a BIG BIG BIG fan of manchester united as well.. I could imagine your brother in law were one of those people who cheered screamed when beckham landed in LA..heehee..well, I wish at least MU gonna win the premier league..
Elise wow you really have hit all bases now! 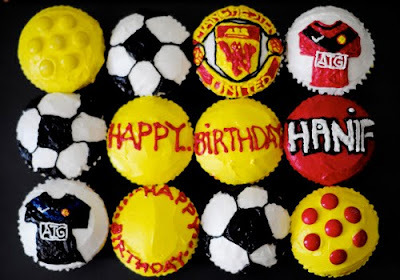 Soccer cupcakes. Loved the post. And yes, I am hoping for a Premier League Title for Manchester United. If not, at least that Sir Alex sticks around and Rooney is healthy.